I didn't grow these ramps in my garden - they were farm fresh from the Union Square Green Market. The recipe, however, is my own. Stir-fried with broccoli and drizzled with a soy-hoisin-sweet-chili sauce mixed in relatively equal proportions, the ramps were delicious and the main attraction. I served the dish with a side of faro (because I ran out of both quinoa and brown rice) and was surprised by how well the grain complemented the veggies. I have always struggled to find a good recipe for ramps each spring, last-resorting to ramps and eggs, which is certainly tasty, but not terribly exciting. 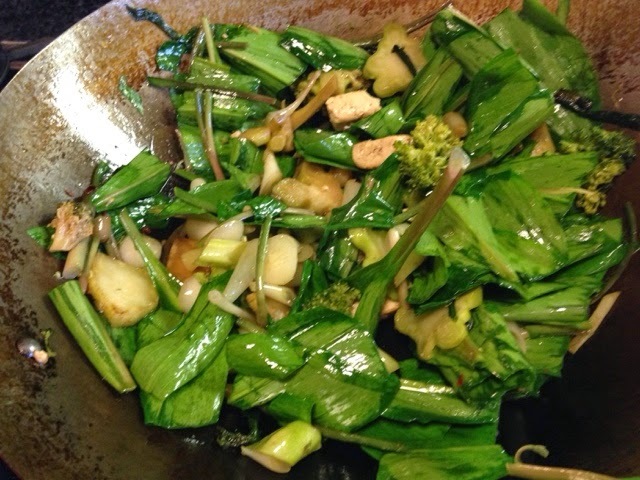 Cooking them Asian-style really brought out the best in the wild spring onion. The ramp bulbs maintained their crunch and the greens wilted like spicy spinach. The WOK made all the difference in enhancing the ramps' earthy flavor. This is a recipe I will come back to year after year.